James Tissot. Too Early. 1873. Oil on canvas. London: Guildhall Art Gallery. James Tissot. Hush! 1875. Oil on canvas. Manchester: City of Manchester Art Galleries. Hush! (1875) presents another snapshot, perhaps from a later moment at the party seen in Too Early. Like the previous painting, critics found themselves able to identify with the scene. “This is a picture which cannot fail to interest the majority of the visitors to the academy, because it deals with incidents and people with which the are abundantly familiar,” wrote one. Although all the guests have arrived, they still appear vastly uncomfortable. No one is interested in the impending performance, too concerned are they with appearing fashionably nonchalant. The sweeping curve of the staircase, viewed through a back doorway, and the circle of chairs around the violinist suggest a literal social circle, into which the viewer is invited. 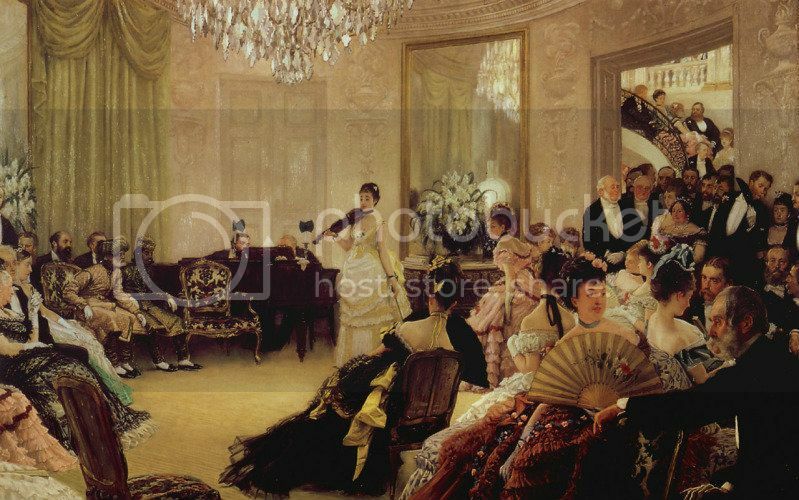 The room depicted is a salon in Kensington, and the party has been identified as one hosted by the Coope family and attended by Tissot. 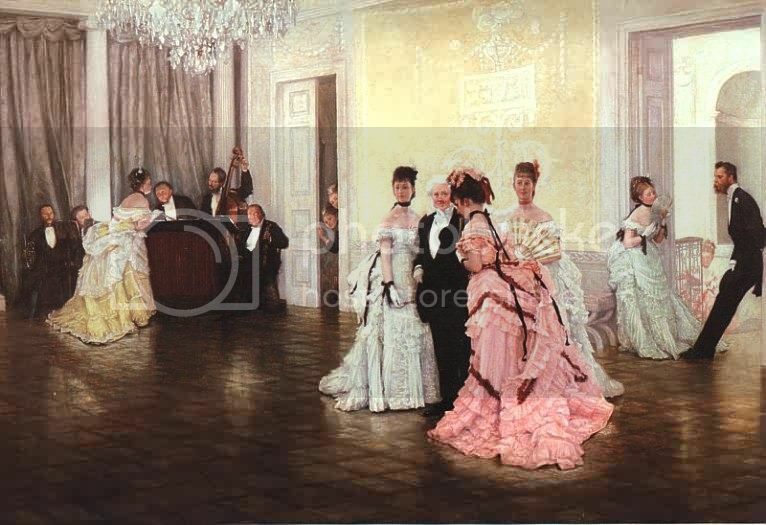 Although Tissot claimed the subjects were anonymous, scholars have identified various real figures: Sir Jules Benedict (the pianist), artists Giuseppe de Nittis and Ferdinant Heilbuth, and Vanity Fair publisher Thomas Gibson Bowles. Hush! was Tissot’s greatest commercial success, selling for 1200 guineas. James Tissot. The Ball on Shipboard. 1874. Oil on canvas. London: Tate Gallery. 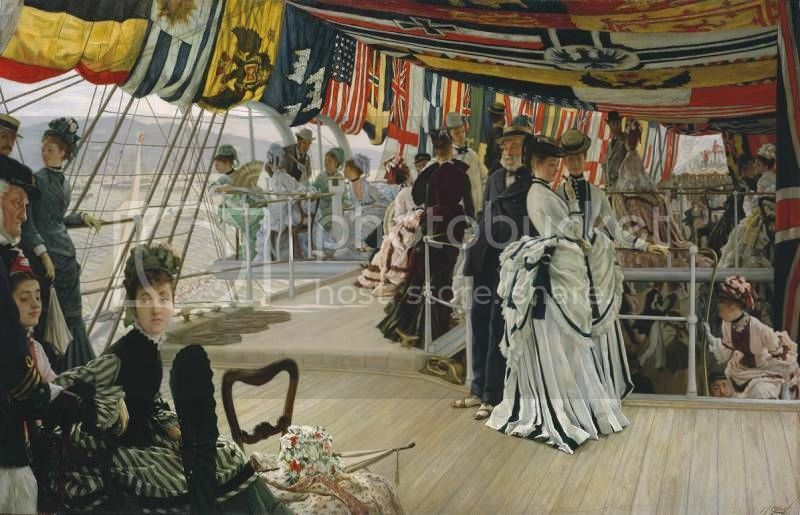 The Ball on Shipboard (1874) presents a different, although no less awkward, social scene. The painting is set on the royal yacht, the Victoria and Albert, at Cowes on the Isle of Wight. The ship is decorated with various national flags, and various members of London society have gathered for socializing and dancing. Yet once again, there is an overtone of boredom. The woman closest to the viewer, wearing a black and white striped gown, stares blankly into the distance. Two women in matching white dresses stand awkwardly, looking away from each other with neutral expressions while their elderly companion leans lazily against a railing. Critical reception to The Ball on Shipboard was negative. The work was described as “vulgar”, a loaded term in the nineteenth century. According to John Ruskin, vulgarity could be defined as “an undue regard to appearances and manners… and an assumption of behavior, language, or dress, unsuited to them, by persons in inferior stations of life.” Indeed, although the figures on the ship seem to be members of good society, a deeper analysis suggests otherwise. The women in green and blue, seated in the background on the left of the canvas, display too much décolletage for the daytime. One commentator described the image as “a set of rather showy than elegant costumes, some few graceful, but more ungraceful attitudes, and not a lady in a score of female figures.” Furthermore, the gowns worn by many of the women are unnecessarily showy, with bright colors and multiple ruffles, suggesting the ‘vulgar’ ostentation associated with social climbers and the nouveau riche. These elements combine to suggest the instability of society of the period, where wealth was replacing heredity, an uneasy notion for many.